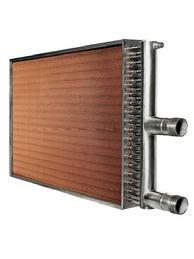 Luvata steam coils are specifically desinged with condensate management in mind. Tube and connection sizes are combined to limit condensate retention in the coil, preventing water hammer while delivering even distribution of steam on the entire face. With single-tube coils, the steam supply and condensate return headers and connections are normally at the opposite ends of the coil. 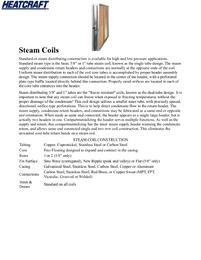 Uniform steam distribution to each of the coil core tubes is accomplished through carful header assembly design. The steam supply connection should be located in the centre of the header, with a perforated plate-type baffle located directly behind this connection. Carefully sized orifices are located in each of the core tube entrances into the header. Dual-tube coils utilise a smaller inner tube, with precisely spaced, directional, orifice-type perforations. 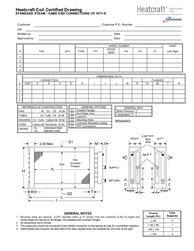 This helps to direct condensate flow to the return header. The steam supply, condensate-return headers and connections may be fabricated in 'same-end' or 'opposite-end' orientation.